In Hardhats, Hippies, and Hawks, Penny Lewis shows that working-class people played an indispensable role in the movement to end the Vietnam War. The U.S. movement against the Vietnam War was composed of grungy white college kids from privileged backgrounds who looked down on working-class people and spat on soldiers; the latter groups, in turn, despised the movement and staunchly supported the war. So goes the familiar historical narrative, pervasive in mainstream depictions and common even among observers sympathetic to the movement. 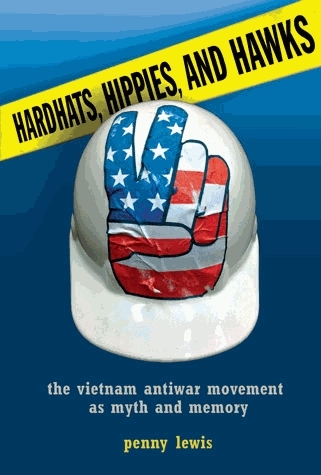 In Hardhats, Hippies, and Hawks: The Vietnam Antiwar Movement as Myth and Memory, Penny Lewis demolishes this mythology, showing that working-class people were at least as opposed to the war as the middle and upper classes and that they played an indispensable role in the movement to end it. After surveying opinion polls from the era, Lewis concludes that “working-class people were never more likely than their middle-class counterparts to support the war, and in many instances, they were more likely to oppose it.” The “middle-class culture” of many student and pacifist groups, and their lack of outreach to workers, did initially deter the latter from joining organized antiwar efforts. But things changed by the late 1960s. Narratives that frame 1968 as the movement’s peak are misleading, for after that year “the movement formed deeper roots among people of color, religious communities, labor unions, the armed forces, veterans and students” from working-class backgrounds. Moreover, although many formal organizations declined after 1969, the total number of participants in the movement continued to grow. The black and Chicano movements were among the most militant antiwar voices. Most of the participants in these movements were of course working-class, even if class identity was not their primary basis for mobilization. These movements were the most effective at articulating the connections between U.S. imperialism in Vietnam and racism and poverty in the United States. Martin Luther King, Jr., in the last year of his life was the most visible such critic, condemning “the triple evils” of racism, militarism, and economic exploitation. Black and Chicano critiques of the war, like most working-class critiques, were rooted “in both morality and pragmatism”: their opposition derived from a sense that the war was evil but also from the negative effects it had on their own lives. Lewis implies that antiwar movements should combine moral condemnation with appeals to the self-interest of exploited groups in the imperial center. King did so very effectively, identifying with the Vietnamese while also denouncing the victimization of soldiers, workers and the oppressed in the United States. The most consequential resistance on the U.S. side was in the military, which was overwhelmingly composed of working-class soldiers. Defiance took many forms, including draft resistance, desertion, collective evasion of combat, attacks on officers and declining enlistment rates. While draft resistance was largely a middle-class phenomenon, “deserters were significantly more likely to be from working- or lower-class backgrounds,” and from rural areas. Soldier resistance was tremendously important in compelling the U.S. withdrawal from Vietnam. In 1971 Fortune magazine warned that “dangerous shortages of men prevail in every branch of service, seriously impairing combat capability.” The year before, such shortages led the Joint Chiefs of Staff to request an acceleration of the U.S. withdrawal. This resistance usually occurred outside the auspices of formal organizations. By going beyond an “organization-centered approach” to social movements, Lewis’s account captures the diverse forms of resistance that helped end the war. Lewis also explains why the dual imagery of hawkish “hardhats” and privileged hippies has nonetheless dominated our collective memory. She details the consolidation of this myth in TV shows, movies, press reports, history textbooks, political speeches and even academic studies. The myth took hold in large part because it served pro-war voices in their efforts to discredit antiwar protesters. Yet political usefulness is not the only reason for the imagery’s persistence. Like all effective propaganda, the stereotypes were partly based in reality. The failures of the middle-class left were real. In the movement’s early years, formal antiwar organizations were dominated by middle-class voices who “did not, by and large, speak to working-class concerns.” Intellectuals like C. Wright Mills and Paul Goodman, who had great influence on the New Left, often dismissed U.S. workers as ignorant or reactionary. Conversely, the image of the hawkish worker was not entirely without basis. Many labor leaders shamefully supported the war, but racism and jingoism also had substantial roots in the rank-and-file. The political relevance of this book is far-reaching, and not limited to issues of war and peace. Lewis is right that “memories about the U.S. war in Vietnam” have been central to “conflict about what ‘we,’ in this country, are all about.” She challenges the notion that white workers’ enthusiasm for the Democrats has waned because of the party’s identification with civil rights or gay marriage. Rather, the failure of the Democratic Party and most labor unions to pursue a strong pro-worker agenda has understandably caused many workers to question those institutions. Yet Lewis’ account also suggests the potential for a progressive, anti-imperialist, multiracial movement of working people. That potential still exists, and the need is more urgent than ever. Kevin Young recently completed his Ph.D. in history at Stony Brook University. He has worked as a political organizer in a variety of contexts, including the labor and antiwar movements. I remember the Vietnam antiwar movement not just for its diversity but for its radical, nonviolent horizontal structure. My most vivid memory is from “May Day” – May 3, 1971. By the winter of 1971, many, especially young people, believed that the massive – numbering in the hundreds of thousands – peaceful, sanctioned political protests would not end the war. The more militant, leftist elements of the anti-war movement felt that nonviolent direct action was necessary. May Day was organized by a diverse group of people under the banner of the politically horizontal “May Day tribe,” with the explicit goal of shutting down the heart of the war machine, Washington, D.C. The plan was to block key intersections and bridges by nonviolent civil disobedience. By some accounts over 100,000 people took part in the nonviolent direct action. At a time when the U.S. was widely regarded as the world’s model of freedom and democracy, well over 10,000 elite soldiers, national guard and various police were deployed to quash the nonviolent resistance. Well over the official 12,614 people were arrested – the largest mass arrest in U.S. history. I say well over, because many of those arrested never made it to the concentration camp set up outside RFK stadium. The system was obviously overloaded processing that number of arrests. After the police arrested someone, they were taken to the circles and squares – still surrounded by troops. Hand cuffs and transport were in short supply so most of the protesters were simply loaded onto metro buses. The buses then went in convoy to RFK, usually with a driver and one policeman per bus, with a motorcycle cop between buses. While some of the buses were stopped in the ensuing gridlock, the protesters quickly organized escapes by pushing out the metro bus windows and fleeing into the predominantly black neighborhoods. Some blacks, unused to seeing white’s hauled off in mass to jail, acted in solidarity by providing shelter in their homes to the escapees. Over 40 years later it is almost unfathomable that something like this could have actually happened in the U.S. Over 12,000 arrested, the city of D.C. shut down – at least for part of a day. Today, most people in the U.S. don’t even know that May Day ever happened. Until recently, if you asked them – or me – if something like this was possible again, they would say no. Impossible, until Occupy when people once again people began to imagine that a new world was possible. It’s true that popular media often convey these myths, but historians and progressive activists rarely do. ” The publicity given to the student protests created the impression that the opposition to the war came mostly from middle-class intellectuals. When some construction workers in New York attacked student demonstrators, the news was played up in the national media. However, a number of elections in American cities, including those where mostly blue-collar workers lived, showed that antiwar sentiment was strong in the working classes. For instance, in Dearborn, Michigan, an automobile manufacturing town, a poll as early as 1967 showed 41 percent of the population favored withdrawal from the Vietnam war. In 1970, in two counties in California where petitioners placed the issue on the ballot—San Francisco County and Marin County—referenda asking withdrawal of the U.S. forces from Vietnam received a majority vote. In late 1970, when a Gallup poll presented the statement: “The United States should withdraw all troops from Vietnam by the end of next year,” 65 percent of those questioned said, “Yes.” In Madison, Wisconsin, in the spring of 1971, a resolution calling for an immediate withdrawal of U.S. forces from Southeast Asia won by 31,000 to 16,000 (in 1968 such a resolution had lost). But the most surprising data were in a survey made by the University of Michigan. This showed that, throughout the Vietnam war, Americans with only a grade school education were much stronger for withdrawal from the war than Americans with a college education. In June 1966, of people with a college education, 27 percent were for immediate withdrawal from Vietnam; of people with only a grade school education, 41 percent were for immediate withdrawal. By September 1970, both groups were more antiwar: 47 percent of the college-educated were for withdrawal, and 61 percent of grade school graduates. There is more evidence of the same kind. In an article in the American Sociological Review (June 1968), Richard F. Hamilton found in his survey of public opinion: “Preferences for ‘tough’ policy alternatives are most frequent among the following groups, the highly educated, high status occupations, those with high incomes, younger persons, and those paying much attention to newspapers and magazines.” And a political scientist, Harlan Hahn, doing a study of various city referenda on Vietnam, found support for withdrawal from Vietnam highest in groups of lower socioeconomic status. He also found that the regular polls, based on samplings, underestimated the opposition to the war among lower-class people . ” (from the version of People’s History at http://www.historyisaweapon.com/defcon1/zinnimvivi18.html). A good summary of some other historical scholarship making some of these same points is at: http://chnm.gmu.edu/hardhats/hindsight.html. One question: given the title of the book, and the importance of the event for the formation of the myth, is there an extended discussion in this book of who organized the Hard Hat Riots of May 8, 1970 in New York City? George Katsiaficas, in The Imagination of the New Left: A Global Analysis of 1968, claims that construction workers were paid to take the day off if they would go beat up anti-war demonstrators, and that Nixon’s Watergate plumbers helped orchestrate it (see http://books.google.com/books?id=PjCRRVjalVoC&pg=PA136&lpg=PA136&dq=nixon+paid+for+construction+workers+to+attack+anti-war&source=bl&ots=8zT17DLN02&sig=_7czZAl9Myti0SAcCADE1Rm93c8&hl=en&sa=X&ei=vKLWUpaAJIjPsATauoHQBA&ved=0CE0Q6AEwBA#v=onepage&q=nixon%20paid%20for%20construction%20workers%20to%20attack%20anti-war&f=false). Unfortunately, the footnote for that paragraph is not visible via Google Books, and I don’t think I still have a copy of it at hand. by Joshua B. Freeman, available at http://jsh.oxfordjournals.org/content/26/4/725.full.pdf+html) makes no mention of possible Nixon administration orchestration, beyond mentioning that Peter Brennan, the head of the construction union in NYC who played a key role in initiating the riot, was later made Nixon’s Secretary of Labor (tasked especially with blocking affirmative action initiatives) as a reward. Great review! Thanks Kevin. Lewis certainly adds an important dimension to the existing historical literature. I wonder though, as one skeptical of opinion polls, to what extent his evidence was too reliant on this kind of data?